EXPOSED THAI VISA DOT COM! Outside the factory on a massive trading estate near Bangkok, the temperature is almost 100 degrees. 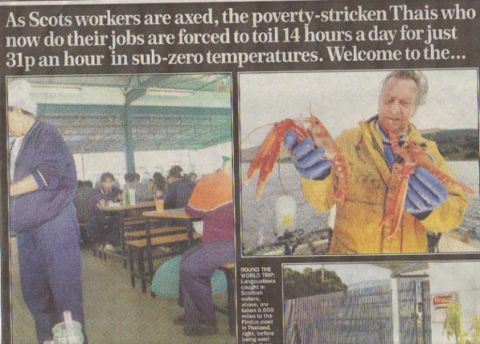 Inside, Thai workers are shivering at minus 10 as they monotonously grind away, chopping, vacuum-packing and packaging a variety of fish caught in the waters off Scotland that is to be returned to the British market. New members of the workforce at Findus (Thailand) are puzzled at the species they are handling. They know catfish, red snapper and sea bass from the warm waters of the Gulf of Thailand and the Indian Ocean. But here they are dealing with salmon fillets and skewers and cod loin, which they are packing for the British market at Ãƒâ€šÃ‚Â£3.99. This is Findus’s so-called Gourmet Range of frozen foods. This is the factory where next year Young’s Seafood will start sending the first of 600 tons of Scottish langoustines on a three-week ocean voyage, to be de-shelled before being sent the 6,000 miles back again to be packed and sent to British supermarket shelves as breaded scampi. The move has sparked outrage in Scotland, with unions and politicians condemning the company for sacking half its workforce here so it could save money by deshelling the catch on the other side of the world. But with workers in Bangkok being paid 31p an hour compared to Ãƒâ€šÃ‚Â£6 an hour at Young’s Scottish plant in Annan, Dumfriesshire, the company’s motivation is clear. One Thai worker is the economic equivalent of 20 Scots. This is the basic arithmetic that has already persuaded Findus, Young’s sister company, to use Thailand as a major processing factory for Atlantic and North Sea fish caught for its European markets. The Mail on Sunday asked Findus (Thailand) for permission to visit the factory. It referred us back to England and a public relations firm called Wordbird. Our request was ignored for several days before company boss Christine Solloway told us she was ‘not about to put Young’s in the centre of any more media attention over the matter’. So we sent factory worker Tippawan to apply for a job at the factory. In Samut Prakarn, 30 miles west of Bangkok, in the export-processing zone of the Bang Poo industrial estate, is the Thai processing arm of Findus, which shares a joint head office with Young’s in Malmo, Sweden. A small workforce, mainly women, are employed in shifts of about 100 people, processing fish for the British market behind a blue wrought iron fence. Gleaming new BMWs are parked in the management lot at the front of the premises. But in the freezing heart of the factory, workers toil up to 12 hours a day before sending the fish, caught in the cold northern waters, back to Britain’s supermarkets. They are bussed in from distances up to two hours away for a daily fee of 80p, deductible from their wages. Tippawan explained to us just why it is so profitable for Young’s, Findus and other European seafood firms to send their fish halfway around the world before serving it up to customers back where it was caught in the first place. She said: ‘When I went for an interview I was told there was a very high turnover of workers because many could not stand the cold. I was told that there was overtime and I was expected to do it. ‘If I declined overtime, I would not be offered overtime for two months. The pay was 194 baht for a nine-hour day, from 7am to 4pm (Ãƒâ€šÃ‚Â£2.85, only 4p over the Thai minimum daily wage). Tippawan said that if she worked the full 12-hour day she would receive a total of 315 baht with overtime (Ãƒâ€šÃ‚Â£4.63), adding: ‘This is good money in Thailand. We only get one day off a week, so in a month I could earn 7,556 baht (Ãƒâ€šÃ‚Â£111.10). ‘When I turned up for work, everything was spotlessly clean. I was taken to a changing room and was told to put on plastic boots, cap, trousers and warm jacket. ‘I also wore a shirt which was tight at the neck and around my wrists. Our worker was led through plastic curtains into a cold room where tables were set out. She said: ‘Men would come in from the freezer room with trays of cut and filleted fish. There was cod, salmon and salmon on sticks. ‘My job was just to put them the right way in bags, which were then taken away down the line to be vacuum-packed and then packaged. ‘Nobody spoke. There was no time. We worked non-stop until 11.30am and then had an hour break in a canteen for lunch. Then it was back to work again. She added: ‘At the end of the day at 4pm, I could not stand the cold any more. They asked me to do overtime until 7pm and most people did – they all needed the money. ‘I needed the money too, but I could not stand the cold and the boredom, and the lack of contact with people. Tippawan left Findus and now hopes to land a job in a Nike sportswear factory. Apart from the extreme cold, working conditions at Findus (Thailand) are typical of the country. Employers do not have to pay tax for people whose basic pay is 6,000 baht (Ãƒâ€šÃ‚Â£83.23) or less a month. They pay health insurance on behalf of their employees but these sums are invariably deducted from salaries. Thai workers are legally entitled to only one day a week off and six other days during the year. Multinational companies are careful to check that factories comply with local laws and international hygiene and safety regulations. Far from being concerned about the low wages of the workers, this is the very attraction. It is small economic wonder that Young’s Seafood is moving to Thailand. full journey of Scottish langoustines ‘from boat to plate. Consumers may not want to know that next week’s fish supper was last week trundling through the South-East Asia Suez Canal, having toured the Gulf of Thailand.